The UW Event Calendar is integrated with the UW Groups service. This integration allows you to give permission to people you choose to edit your departmental calendar, simply by adding or removing their NetIDs from groups that you manage through the UW Groups service. Follow the steps below or watch a video that walks you through adding and removing editors. Learn more about the UW Groups service. Note: Any member of an editor group (except shared UW NetIDs) can add or remove other members to or from the same editor group. Use of shared UW NetIDs for calendar administration is strongly discouraged. Because shared UW NetIDs are used by multiple people, the IDs provide no way of tracing calendar activity to a particular person, which may be warranted in case of misuse. Go to http://groups.uw.edu. The first time you log in, you may be asked to select two-factor authentication. Near the top of the page, click My Groups. Locate and select the editor group you want to update (to identify editor groups, look for “-editor” at the end of the name). On the next page, click the blue Membership link. In the green Add members field, enter the UW NetID of the new member. When you have added all UW NetIDs, click Do it. Below the Add members field, in the Direct Membership list, verify that the UW NetID has been added. Allow up to 10 minutes before the new editor can access the UW Event Calendar. In the green Remove members field, enter the UW NetID(s) of the member(s) you want to remove. When you have removed all UW NetIDs, click Do it. 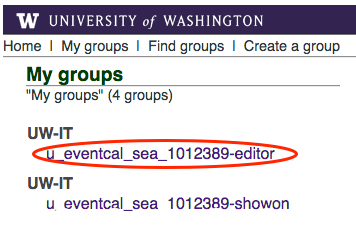 Below the Add members field, in the Direct Membership list, verify the removal of the UW NetID(s).